DON'T JUST REBUILD YOUR ENGINE, IMPROVE IT! EPS Engine rebuilds are performed with exclusive improvements that correct factory defects, resulting in a better and more reliable product. The long list of upgrades begins by correcting the IMS bearing with a permanent non-maintenance cylindrical roller bearing with integrated oil feed, leaking rear main seal with a new #8 bearing that provides additional support to the crank, cylinder scoring with wider piston skirts and oil spray diverters for better lubrication, rod and main bearing weakness with larger surface-area bearings, and a superior oil separator. The engine is stripped to bare components and put into a high pressure wash at high temperature with cleansing chemicals, this removes all carbon deposits and debris from previous failures. From this stage the cylinder bores and pistons are checked for cracks and wear tolerances. If your returned engine core requires cylinder re-sleeving this will be completed at an extra cost. We address the infamous IMS and permanently correct it using our revolutionary ETERNAL IMS Bearing and oil feed modification. Unlike the other failure-prone ball bearing products that the original IMS and other upgrades on the market use, EPS uses a patented cylindrical bearing with thrust control that can be pressed directly into the back of the engine. The cylindrical bearings have over 12 times the load capacity of other ball bearing solutions making the EPS IMS bearing the clear choice. Our technicians have developed a Rear Main Seal Housing (RMSH) that presses to the back of the engine. The RMSH adds one more main bearing for added support to the back of the engine. The additional rear bearing support prevents RMS oil leaks, premature #7 main bearing failure, cylinder #6 rod bearing failure, and twisting of the crank, extending engine life. The Rod and Main bearings are replaced with EPS bearing shells that are 18% wider than stock. These large bearings have more surface contact area on the crank, making the bottom end of the engine stronger and more durable. 1) Passing through a high temperature oven. 3) Placement in a non-caustic hot tank. The Head is then inspected for cracks & pressure tested. Cam bores are checked for spec and honed if needed. - Inspect valve guide bores using a dial bore gauge and repair where needed. - All valve seats are cut, not ground, using three angle cuts for maximum precision. - The valves are inspected for stem and valve face damage and/or wear, as well as straightness. - All valves are hand ground and/or replaced as needed. - Thoroughly inspect and test all of the valve springs for proper tension / resistance and replaced as needed. - All head surfaces are machined (milled), not ground! Cleaning all heads in a solvent base tank in which all oil galleries, thread holes, etc. are cleaned. A number of different brushes are used to catch any remaining contaminants. All heads are run through a detergent based hot tank before assembly. All assembly work is done by hand by a professional Porsche specialists. EPS Engines are rebuilt using high quality, specially designed J.E. Pistons. The piston skirts are modified specifically to prevent cylindrical scoring. The rist pin position is also modified to improve the angle of the rod to the piston. This modification reduces piston to cylinder wear, extending the life of the pistons & cylinders. Reducing cylinder oval maintaining a round cylinder. Additionally, on the 3.6 litter engines we modify the piston/cylinder geometry to further extend the life of the engine. EPS engines are fitted with ductile cast iron sleeves. Ductile sleeves are the best type of cylinder sleeves available. 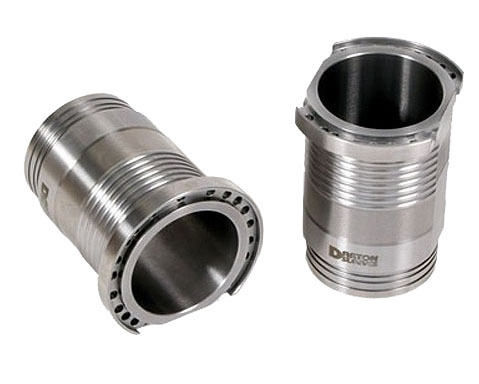 Ductile iron engine cylinder sleeves are the standard in the high-performance engine world, for engine builders that are producing high horsepower and highly boosted engines that are generating a lot of torque. Ductile Iron is a specific type of cast iron which has an addition of magnesium to it to make the graphite in it nodular. The nodules strengthen the material in a couple of ways. They add to the tensile strength of the iron and they also increase its impact resistance. Ductile iron also has an elongation factor in it that allows the material to “flex” somewhat inside the bore. This is the “bend but don’t break” advantage of ductile iron over cast iron in your cylinder liner. The M96 & M97 engines suffer from upper cylindrical scorching on cylinders number 4,5,&6. This problem is caused by poor lubrication at the back of the piston. The EPS engine is modified so that the oil squirters are redirected and aimed to the proper lubrication area. Using only Genuine German (OEM), the engine is reassembled to factory specs.